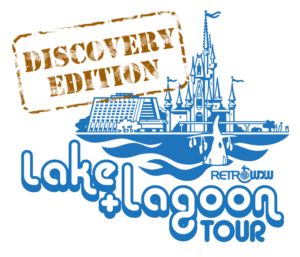 Join the RetroWDW crew and set sail on a tour of Bay Lake and the Seven Seas Lagoon! In 2016 we held the Lake and Lagoon Tour where we commandeered a number of pontoon boats and sailed with our listeners on a tour of Bay Lake and Seven Seas Lagoon. Due to the small size of the boats we had a limited number of tickets to sell, as a result the event sold out in 9 minutes! We always knew we could do better, and for the past year we’ve been working to host the tour again, only this time with a larger boat; one that has a proper audio system for our tour narration and can accommodate our whole group together. Tickets are LIMITED and are sold on a first come first serve basis. All sales are final, no rain-checks or refunds. Your tour time is a request and may change due to weather, Disney’s boat needs and consolidation of tours. We will make every effort to keep original sailing times. Price: $40.00 per person, includes one hour tour and a gift. Digital tickets will be sent via email, you must bring a digital or printed copy of your electronic tickets with you to the event; they will be scanned. Please arrive 15 minutes before your sailing time. 15 minutes before your sail time, please report to the red X on the map of the Contemporary Resort to the right. Once there, check-in with the RetroWDW team members; your ticket will be scanned and will serve as a digital acknowlegement of your acceptance of the liability waiver (see below for waiver details). 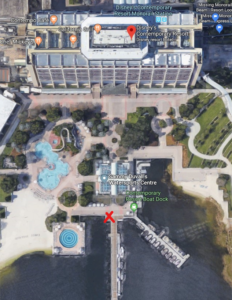 On Saturday November 17th our Discovery River Cruise boats will leave from the dock of the Contemporary Resort Hotel at 11:15, 12:30 and 1:45 PM. Saturday Evening the RetroWDW cast and crew will host an informal happy hour at the Contemporary’s Outer Rim Lounge from 4:30 PM to 6:00 PM. RetroWDW’s own chief mixologist How Bowers will happily consult on libation choices. This event is open to anyone, there is no ticket or fee required. On Sunday, November 18th we will be in EPCOT. We have an 11 AM Fastpass for Spaceship Earth and we encourage interested parties to ride along with us. When our ride is finished we will assemble at the entrance fountain at 11:30 AM to begin our ever-popular free EPCOT Center walking tour. We spend about an hour touring Future World and its pavilions pointing out things that used to be there, remnants of EPCOT Center that are still there, things that were going to be there but never were and lots of little EPCOT history tidbits. This event is open to anyone, there is no ticket or fee required. In the event the boat does no sail the historical tour will be held elsewhere on the grounds of the Contemporary Resort. Total time on the boat will be approximately 1 hour. Alcoholic beverages are NOT permitted on the tour. 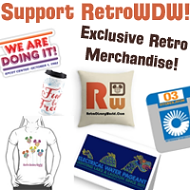 The RetroWDW 2018 Lake and Lagoon Tour is not sponsored by or affiliated with any part of The Walt Disney Company, Destination D, D23 or the Walt Disney World Resort.